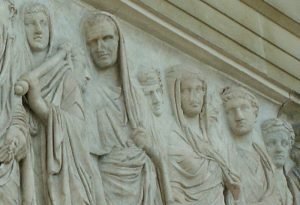 This is a green diabase portrait of Caesar (on the left). It’s now in Berlin, and I believe actually that it is a portrait that was commissioned by Cleopatra herself. 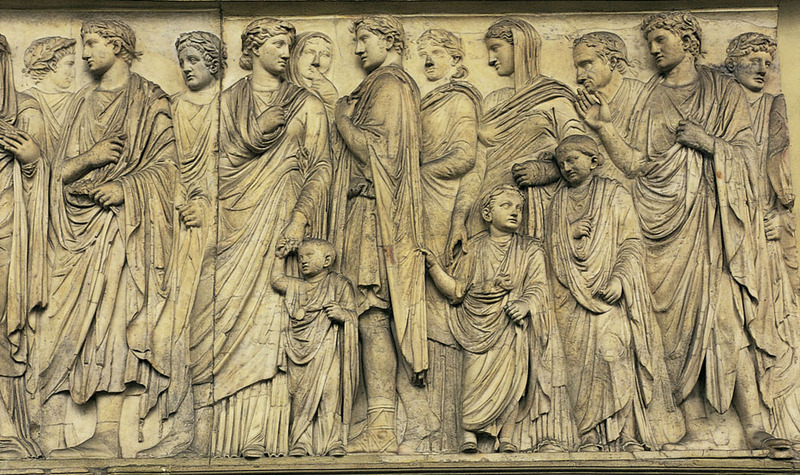 She commissioned it for a building that she and Caesar were putting up in Alexandria, called the Caesareum that honored Caesar, and you can see that he is represented as he was. It’s a quite realistic portrait with the lines and wrinkles, with his receding hairline and so on accentuated in this portrait. On the right we see an image of Pompey the Great, a marble portrait that is now in the Ny Carlsberg Glyptotek, in Copenhagen. 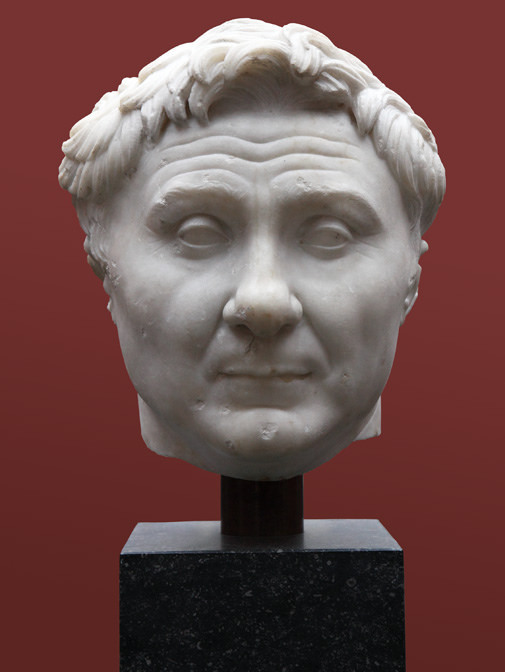 And a portrait that shows that Pompey the Great very much wanted to ally himself with Alexander the Great, because if you look at his very full head of hair, you can see that he wears it in the center, pushed up in a kind of pompadour, which is a reference to the same kind of upsweep that was worn by Alexander the Great. 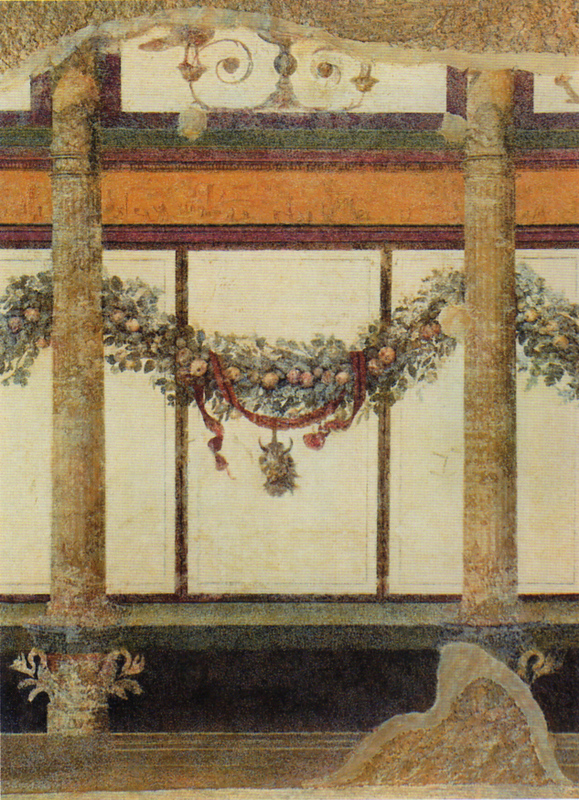 In particular, for the adornment and convenience of the city, also for the protection and extension of the Empire, he formed more projects and more extensive ones every day: first of all, to rear a temple of Mars, greater than any in existence, filling up and levelling the pool in which he had exhibited the sea-fight, and to build a theatre of vast size, sloping down from the Tarpeian rock; to reduce the civil code to fixed limits, and of the vast and prolix mass of statutes to include only the best and most essential in a limited number of volumes; to open to the public the greatest possible libraries of Greek and Latin books, assigning to Marcus Varro the charge of procuring and classifying them; to drain the Pomptine marshes; to let out the water from Lake Fucinus; to make a highway from the Adriatic across the summit of the Apennines as far as the Tiber; to cut a canal through the Isthmus… — Suetonius, The Lives of the Caesars: The Life of Julius Caesar 44:1-3. One building that he was able to complete, or almost complete, was a forum in Rome. 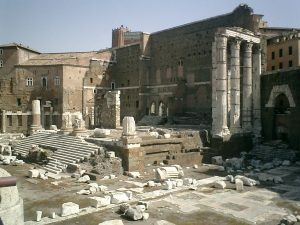 The Forum Iulium, which is after his family name Iulius. 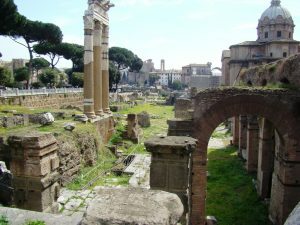 The Forum Iulium, or as we usually call it the Forum of Julius Caesar in Rome was a building that he was able to begin in the year 52 B.C., and then it was inaugurated in 46 B.C., which is a couple of years before his assassination. It wasn’t quite finished at the time of its inauguration and it was left to Caesar’s follower, Augustus, first emperor of Rome, to actually complete some of the details of the forum. But for all intents and purposes it was done by 46. Above is an aerial view of the Roman Forum. 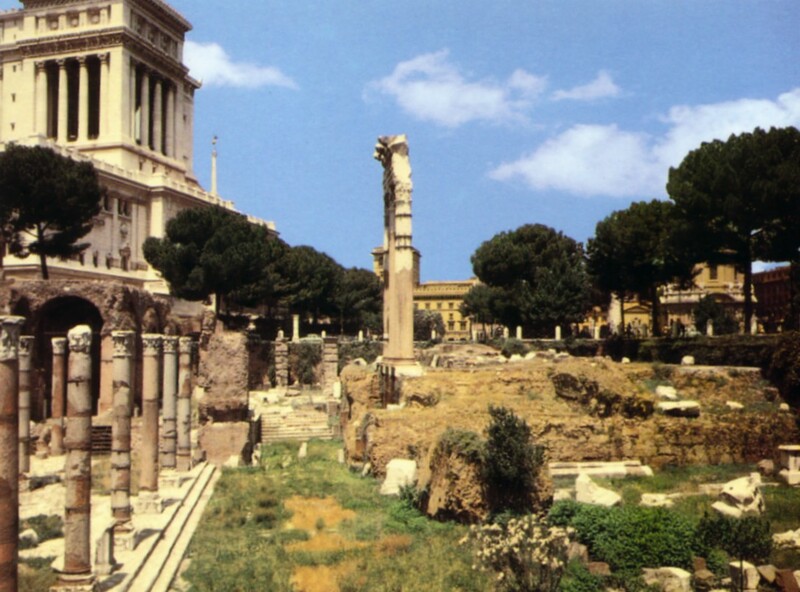 The Forum of Caesar is very close to the Roman Forum. It was adjacent to, and in fact connected to, the Roman forum that lay over here. So a forum, and in that forum a temple, a temple to Venus, Venus Genetrix, who was the divine ancestress of the Julian family. 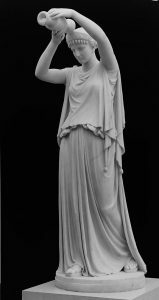 The Julian family traced its ancestry back to Venus via Aeneas, through Aeneas. So this was the very special patron goddess of not only Caesar himself but of the Julian family. 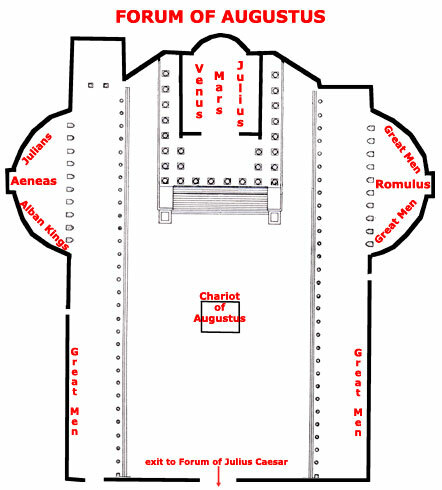 This is a plan of the Forum of Julius Caesar, as it would have looked when the building was inaugurated in 46 B.C. And I think you can see here that it has two major prototypes, models that were being looked back at when this was designed, beginning in 52. You can see that it is based heavily on earlier Roman forum — Samnite/Roman forum design — as we saw it in the city of Pompeii; think of the Forum of Pompeii. But it also was based in part on a building that we have not looked at and which no longer survives, but we have information about, and that is that Caesareum, or Caesareum of Julius Caesar, that he and Cleopatra put up in Alexandria. And we know enough about that building to know it too was an open rectangular space with colonnades around it and a temple as part of it. So this whole idea of temple in a rectangular complex. We see it in Alexandria. Contemporaneously we see it earlier in Pompeii at the Forum of Pompeii. So a great open rectangular space, open to the sky, with colonnades on either side. You can see on this side there are some additional chambers, and based on what those look like in plan. 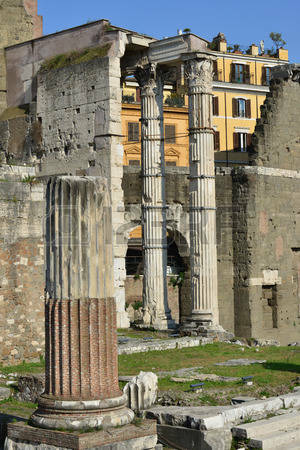 There are a series of shops, or tabernae, opening off the left colonnade of the forum, and then on one of the short sides, pushed up against the back wall – in fact, in this case, almost projecting out of the forum to a certain extent – the Temple of Venus Genetrix. 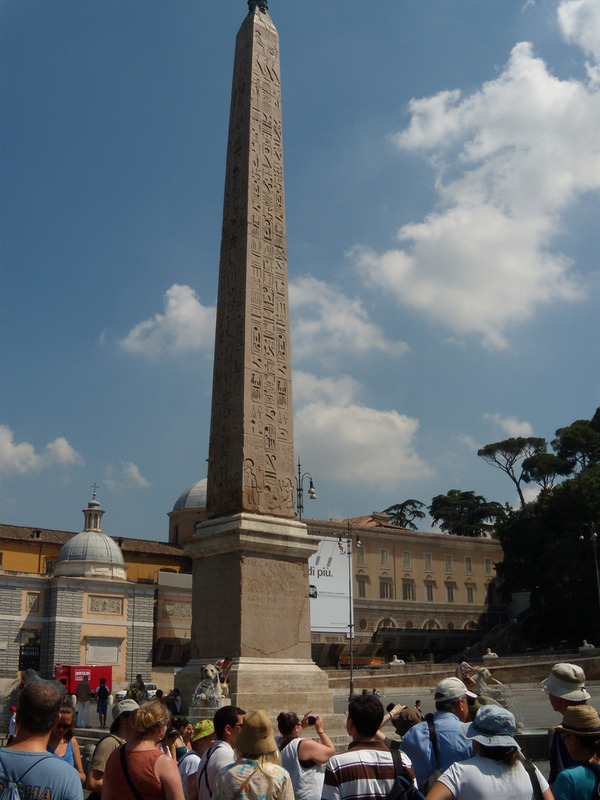 We can see it in plan, and it dominates the space in front of it, just as the Capitolium did at Pompeii. 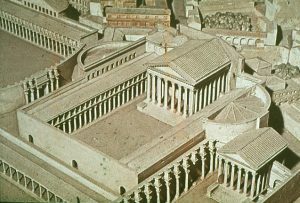 We can see the general plan conforms to early Roman temple architecture, as we’ve described it, with its use of the Etruscan plan and the Greek elevation. We can see that there is–well I’ll show you this in a moment, but take my word–it has a high podium; it has a deep porch; it has freestanding columns in that porch. It has a façade orientation, although one idiosyncrasy of this particular temple is that the staircase is located, not just on the front, but on the two sides, but only at the level of the podium. The staircase does not encircle the building, as it would have in a Greek temple, but it goes beyond the front to the sides of the podium, to allow access to it that way as well. A single entrance, because this is the Temple of Venus and not the Capitoline Triad, and then columns, freestanding columns on either side, but a flat back wall very much in the Etruscan manner. So a temple that is very much in keeping with the other kind of temple architecture that we have seen thus far. 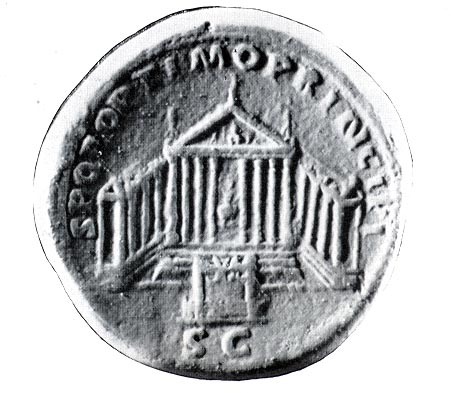 This coin shows the temple as it was in the time of Julius Caesar. 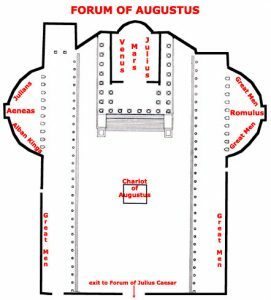 We see the altar in the front, the altar; because the sacrifice always takes place in the front of a Roman temple. 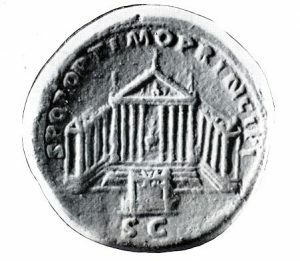 The temple itself, with its columns that are parted on this coin, only to show the statue of Venus Genetrix inside: the cult statue. The colonnades on either side. And then if you look closely at the pediment, you can see that there’s sculpture in there, and we have literary descriptions of what that sculpture depicted, and we know it was a scene of Venus rising from the sea: so Venus Genetrix rising from the sea. The closest thing probably to it is something like, for those of you who know it–Botticelli’s Primavera [Birth of Venus] in Florence is probably sort of the idea here for emerging from the waters, and her depiction in this particular pediment above. 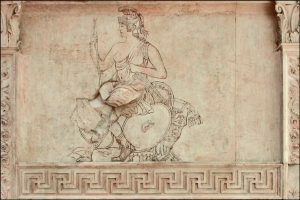 And we know that there were also scenes of cupids carrying the arms and armor, probably of Mars. Here is the architectural detail that still survives, that one can see when one wanders through that forum today. There is very deep drill work here that is actually not characteristic of the time of Julius Caesar, but rather of the time of Domitian and Trajan. So probably this decoration belongs to the later renovation of this particular structure. This gives you perhaps the best idea of what the temple would have looked like in the forum: a restored view of the Temple of Venus Genetrix in the Forum of Julius Caesar. 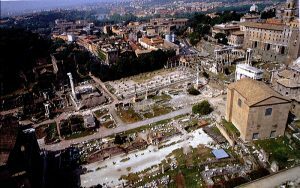 And most importantly what this restored view shows you is the relationship between the Temple of Venus Genetrix and Caesar’s Forum, and the Capitolium, on the top of the Capitoline Hill. 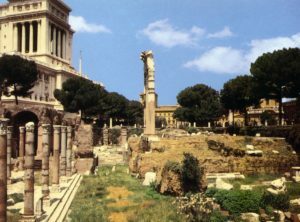 Because when you take away the Victor Emmanuel Monument, which is there now, you can see that the building that was up on top of the hill at this particular time was of course the Capitolium, the Temple of Jupiter OMC. And I mentioned to you at the time we talked about the Temple of Jupiter OMC, although the Campidoglio, as redesigned by Michelangelo, with the Senatorial Palace in the back, which is where the Temple of Jupiter OMC was, faces modern Rome. The ancient temple faced ancient Rome, faced the Roman Forum, and so you see it facing the Roman Forum in this restored view. So I don’t think it was coincidental. 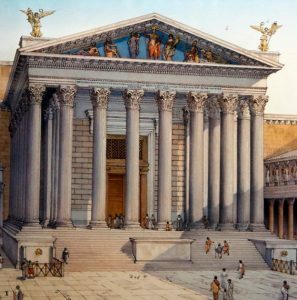 The Romans were very careful, as we’ve learned, about how they sited their buildings, and they liked to make references from one building to another. 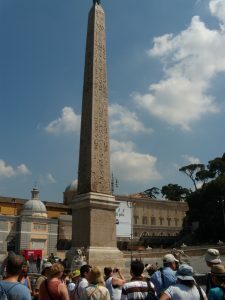 I don’t think it is any coincidence that Caesar chose this site for his Temple of Venus so that anyone who gazed at it would also see, out of the corner of their eye, the Temple of the Capitoline Triad, on the Capitoline Hill, and that would only enhance Caesar’s stature in the eyes of his contemporaries. You see now portraits of Mark Antony, on the righ, a black basalt portrait of Antony, now in England, and a portrait of Rome’s first emperor, Octavian Augustus, on the left, a fantastic bronze image of him that was part of an equestrian statue found in the North Sea near Greece. 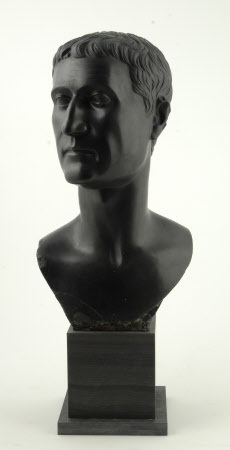 With regard to Antony and Octavian, after Caesar’s assassination in 44 B.C., it was Mark Antony who rose to power. 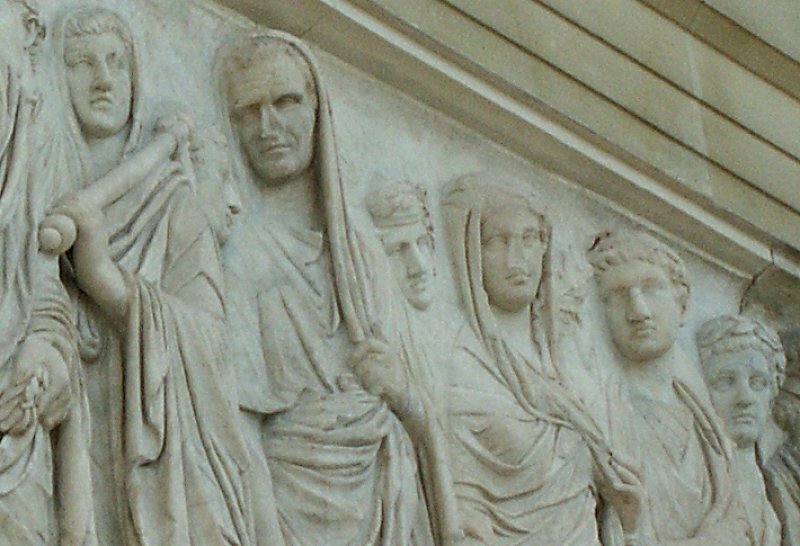 Octavian was only 19 at the time–so your age–and he was the grandnephew of Caesar. So he had a familial relationship, although a fairly distant one, to Caesar: the grandnephew of Caesar. And this 19-year-old upstart tried to overthrow Mark Antony, and he was not successful. In the wise “If you can’t beat them, join them” way of thinking about life and the world, Octavian joined, with Antony, with Mark Antony, and a man by the name of Lepidus, to form what we know of as the Second Triumvirate, and that happened in the year 43 B.C. Once they had formed the Second Triumvirate together, Octavian and Antony took all of their military forces–and each of them had a considerable amount–and they combined them, with the objective of going after Cassius and Brutus: Cassius and Brutus who you’ll remember had murdered Caesar. And they were successful at so doing. They beat and murdered Cassius and Brutus at the Battle of Philippi, in the year 42 B.C. A very important battle, the Battle of Philippi in 42 B.C. 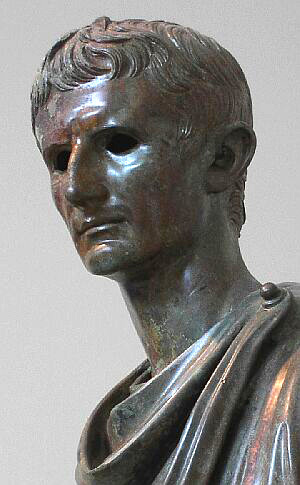 We have additional information about Augustus from Suetonius’ biography of him and from Augustus’ own account of his life and of his accomplishments, and that’s called the Res Gestae Divi Augusti. I mentioned that Octavian took the title of Augustus in 27 B.C., and he was emperor of Rome for a very long time, from that year 27 until his death in A.D. 14, at the age of 76, which was a very ripe old age to live to, at a time when most people–women were dying in childbirth at 10 to 20, and men were dying, for the most part, in their thirties. So 76 was a very old age indeed, in ancient times, and it meant that Augustus was emperor of Rome for a very long period. Since the city was not adorned as the dignity of the empire demanded, and was exposed to flood and fire, he so beautified it that he could justly boast that he had found it built of brick and left it in marble. He made it safe too for the future, so far as human foresight could provide for this. — Suetonius, Lives of the Caesars: Life of Augustus 28:3. Very important for us today are also the words of Suetonius. Suetonius tells us that Augustus bragged that he “found Rome a city of brick, and left Rome a city of marble.” A city of brick, meaning that brick tile that we saw in Pompeii, he found a Rome that was built out of that same kind of brick tile that we saw at Pompeii, but he wanted to transform, he left the city of Rome a city of marble. And that’s exactly the major thrust of today’s lecture: Augustus builds Rome as a marble city in the model of ancient Greece, in the model of Athens, in the Greek part of the world. It’s a rhetorical exaggeration, but we’re going to see, from the two Augustan buildings that I show you today, that it wasn’t far off the mark, that he really did create a city of marble, on the Tiber, and he left for posterity that Greek marble city, a Hellenized city that builds on the Hellenization of Roman architecture that we’ve already talked about. Because what happens is the Romans begin to exploit, in the late Caesarian period and into the age of Augustus, the marble quarries at Luna, on the northwest coast of Italy. 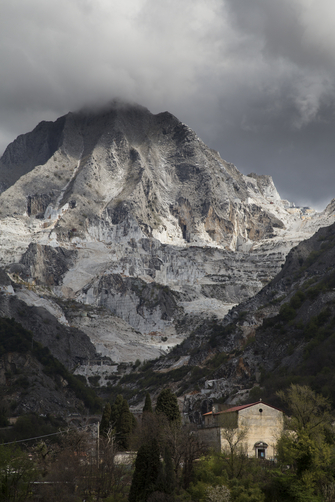 This is the same town as modern Carrara, the same quarries that were used centuries later by none other than Michelangelo himself. Carrara marble, you all know Carrara marble, called Luna, the site called Luna in ancient Roman times. So Luna or Carrara marble. I show you a view here of the marble quarries, or one of the marble quarries, at Luna/Carrara, what it looks like today. 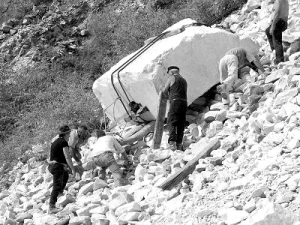 Here men are bringing the marble blocks down from the mountain for use in construction. They basically do it the same way today as they probably did it in ancient Roman times. And it was fairly easy to get this. Since it was on the coast, it was fairly easy to load this marble into boats, bring it down to Ostia, and then up the Tiber to Rome. And that began to be done, with great success, especially in the age of Augustus. Going to Carrara today is a pleasure. 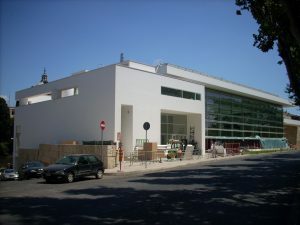 It’s an interesting place to visit, especially if you go there at the time of the marble exhibition that they have and the competition that they have where people make whatever out of Carrara marble and compete for prizes. There are some amazing works of art, we might call them, that come out of these competitions. Here’s one of my favorites. You see here the Luna marble version of an Italian Cinquecento. These Cinquecentos, which were miniscule, are not–not many of them exist today, although you do see some antique versions here and there. 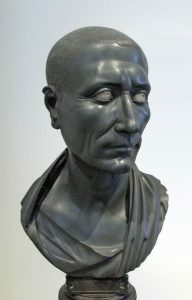 With regard to transforming Rome into a marble city, now that Carrara marble was available at a fairly low cost, compared to the importation of Greek marbles, Augustus begins to build his marble city. And I’m going to show you two major commissions of Augustus today. The first of these is the Forum of Augustus in Rome that was very much in Augustus’ mind from the beginning of his rise to power. In fact, it’s Suetonius who tells us that the reason that Augustus built a forum in Rome was because even though there were already two forums in Rome–that includes the Roman Forum and the Forum of Julius Caesar–even though those two existed and were both being used, that the population–Suetonius tells us the population was growing by leaps and bounds, as were the need to try judicial cases, and that the spaces in the forums–of the Roman Forum, and in the Forum of Julius Caesar–did not allow for the needs of the populace or for the needs of these judicial cases, and that they needed to build another forum. Well, that’s a good story, but the likelihood is it had pretty much nothing to do with that–it may have had something to do with that, but not a lot to do with that–because Augustus had ulterior motives. Augustus — it was at the Battle of Philippi, that battle of 42 B.C. when Mark Antony and Octavian joined forces to defeat the assassins of Julius Caesar. 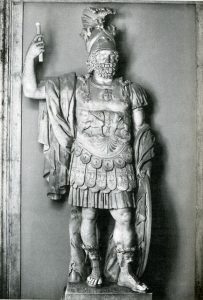 It was right before that battle that Augustus vowed that if he won, if he were successful, that he would build a temple to Mars the Avenger, Mars Ultor, U-l-t-o-r, Mars Ultor, Mars the Avenger, in gratitude for helping him avenge the death of Julius Caesar, the murder of Julius Caesar, the assassination of Julius Caesar. 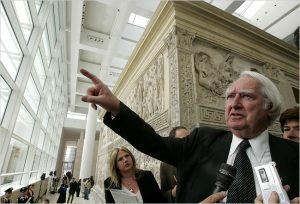 And so when he was successful, he said, “I will build that temple.” And that temple needed an environment, and as we’ve seen, Romans often built temples inside complexes, whether it was sanctuaries or forums, and so he had a good excuse to build a major forum in Rome, as a domicile for the Temple of Mars Ultor. He didn’t get around to it for awhile–again, the Battle of Philippi, 42–but he had a lot of other things to contend with, namely Mark Antony and Cleopatra. It wasn’t until after the Battle of Actium, when he got rid of the two of them, that he had time to build this Temple to Mars Ultor. And we see it beginning to go up in 28 B.C.–so considerably later than the original battle–28 B.C., and it was dedicated in Rome, on a very important date, the date of 2 B.C. So begun in 28 B.C. 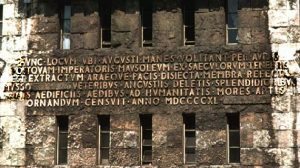 and dedicated in 2 B.C., and that’s the date that I’ve given you on the Monument List, the dedication of the Temple of Mars Ultor and the Forum of Augustus in 2 B.C. 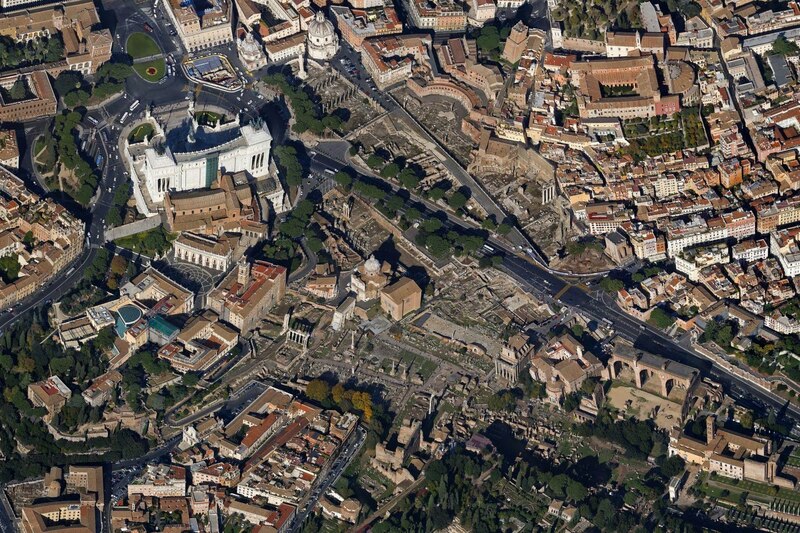 Here’s a view of this part of Rome, showing the connection between. 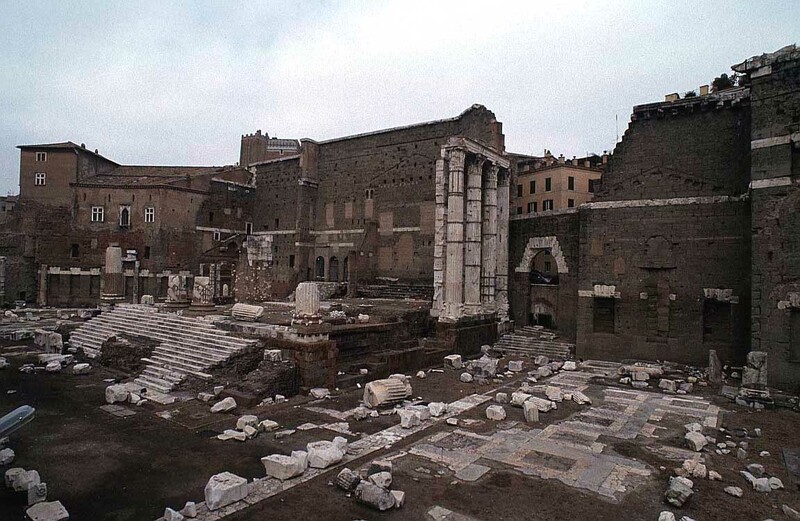 You can see here the Forum of Julius Caesar as it looks today. This is the entrance. We’re moving back toward the Capitoline Hill. These are those three columns that I showed you before, are still preserved, as well as the columns of the colonnade, on the left side, that entered into the shops. Here’s the modern Via dei Fori Imperiali, built by Mussolini. 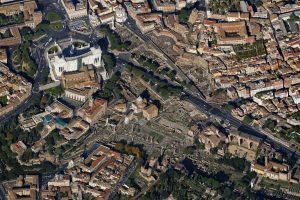 What Mussolini did was slice the Roman Forum and Julian Forum from the so-called Imperial Fora, to which they were originally attached; and any of you who’ve been in Rome recently know that this entire area is being excavated. 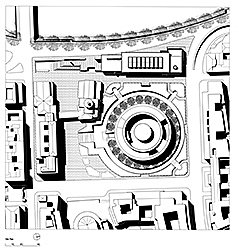 The plan is–the street is still there now, but the plan is eventually–we’ll see whether this really happens, because it would be a traffic nightmare–but the plan is to take that Mussolini street down eventually and reunite all of these forums in some great archaeological park someday. It would be exciting if that were to happen. Here’s a view of the precinct wall as it looks from the outside of the forum today. There are some additions that were made in later times, Medieval-looking windows and the like, but for the most part it’s preserved as it was. You can see we’re dealing with ashlar blocks, made out of peperino stone. We’ve talked about peperino before. It’s a form of tufa, a stone that was used here with ashlar blocks, for the encircling precinct wall. You can see the coloration of those peperino blocks, grayish/brownish color here. And you can see the difference between that and the temple, the remains of the temple, the columns, the steps of the temple, as well as some other decoration, and also some of the walls were made out of Luna or Carrara marble: Luna or Carrara marble for this temple. This is a restored view, which shows you what the temple would have looked like in antiquity, when it was in its final form, and you can see everything we’ve described: the tall podium, single staircase, façade orientation. 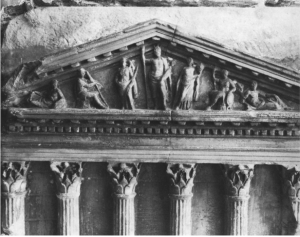 You can see also that there was sculpture in the pediment, and we know something about that. You can see the columns on either side, and you can see in the second story figures of women that we’re going to say something about, and you can see those again on both sides. So this gives you a sense of what the temple would’ve looked like in its heyday. 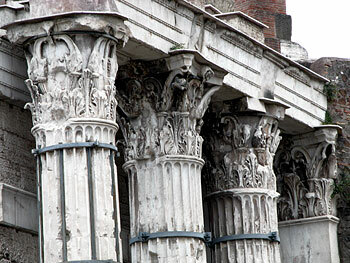 The favored capital column type, and capital of the Romans, the Corinthian, is what is used here. 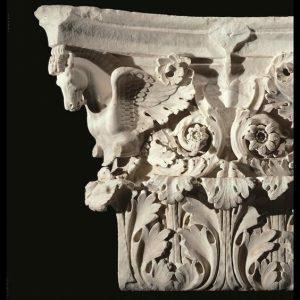 You can see a preserved capital, and how beautifully rendered they were: very high quality, capitals done out of Luna or Carrara marble. We can see the characteristic triple row of acanthus leaves, the spiral volutes growing out of those, the central flower that we see always in the Corinthian order for the columns that were used for the temple and for most of the side columns on the first story as well. 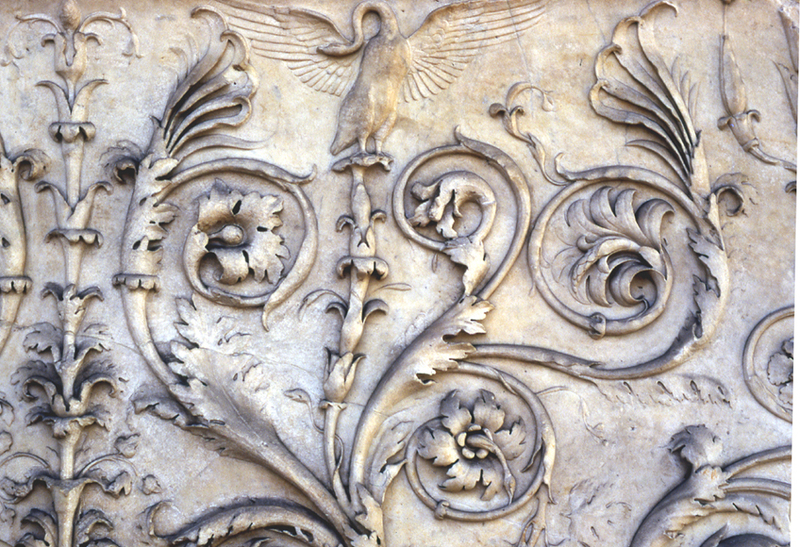 But in some cases those columns were replaced with others that have instead of the spiral volutes growing out of the acanthus leaves, pegasi, winged horses, and I show you a detail of one of those pegasi here. 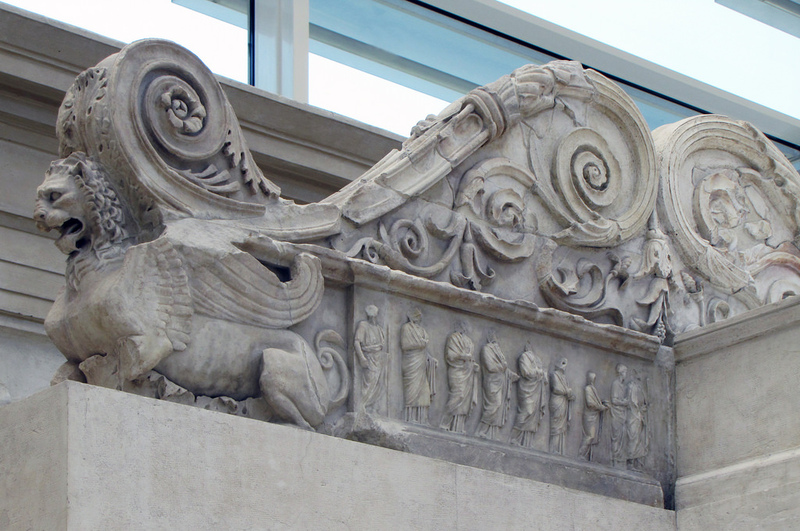 A capital with an animal, replacing the spirals, is called a zoomorphic capital. 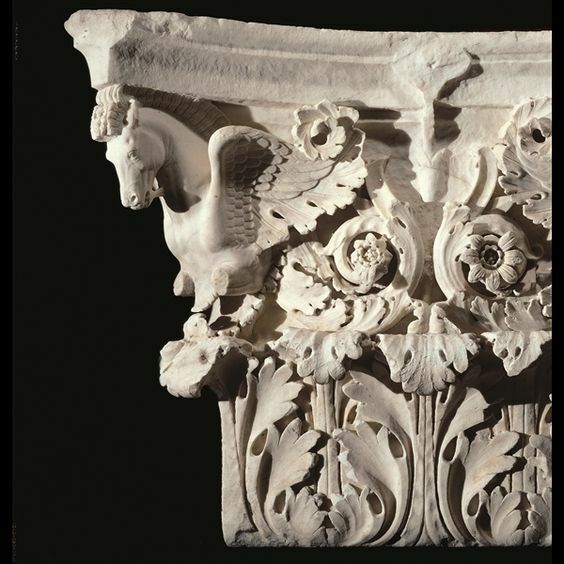 And it’s interesting to note that we see similar zoomorphic capitals in Greece a bit earlier than this structure, at a gateway at a place called Eleusis, and these have, instead of pegasi, these have bull protomes, the tops of bulls emanating out of the acanthus leaves. It seems very likely that there was some interesting architectural exchange – ideas, architects and so on – going on between Athens and Rome in the late Republican period, in the time of Julius Caesar and into the age of Augustus. 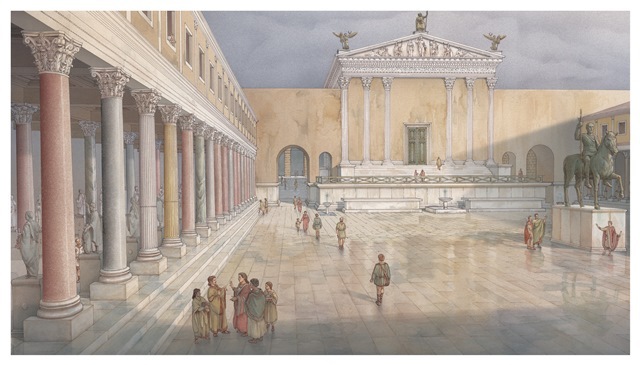 We’re going to see that Augustus not only builds his marble city in order to make it look more like Greece, more like Athens, and to connect his new Golden Age with the Golden Age of Periclean Athens, but we see very specific Greek models being used. 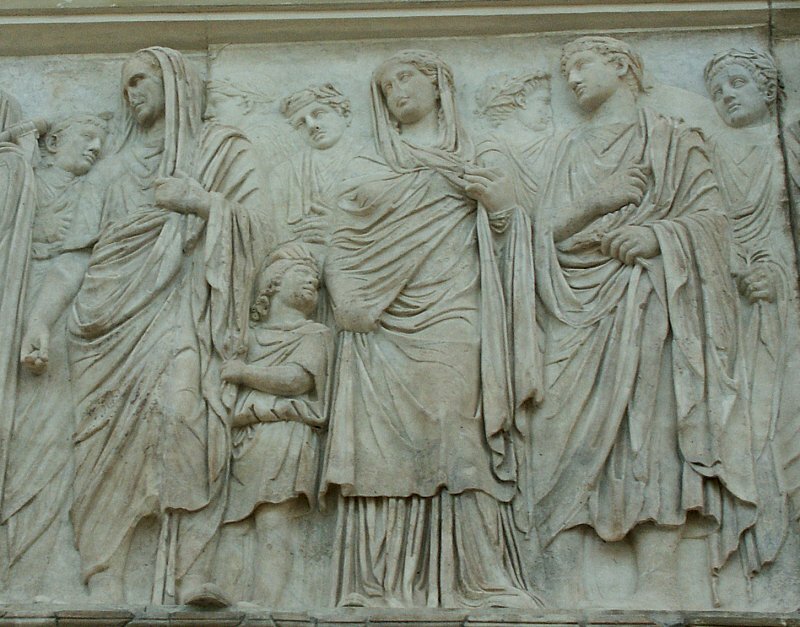 For example, one of these is a frieze from the Forum of Augustus. 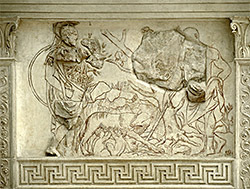 The other is a frieze from the Parthenon on the Acropolis, in Athens, of the fifth century B.C. The Greek frieze is more deeply undercut. 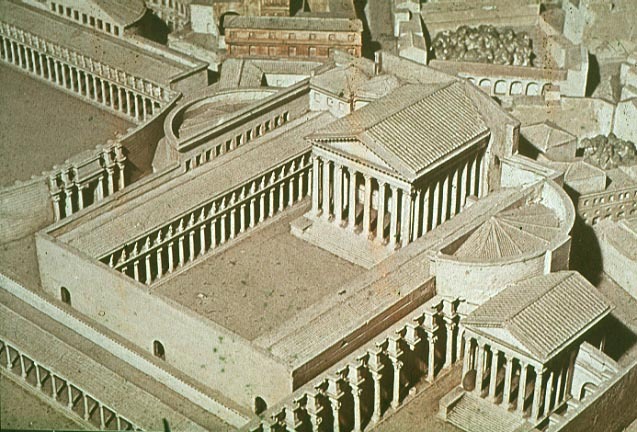 We see here a model of the Forum of Augustus, with the Temple of Mars Ultor inside that forum, with the embracing exedrae or hemicycles on either side. You can see that the exterior of the structure was quite plain, just in the way that a domus italica outside was plain, and it was only when you got inside that you got a real sense of the glory of the architecture. So I think you can see well here. And most interesting for us, I mentioned that these columns on the temple were Corinthian; the columns on the first story. 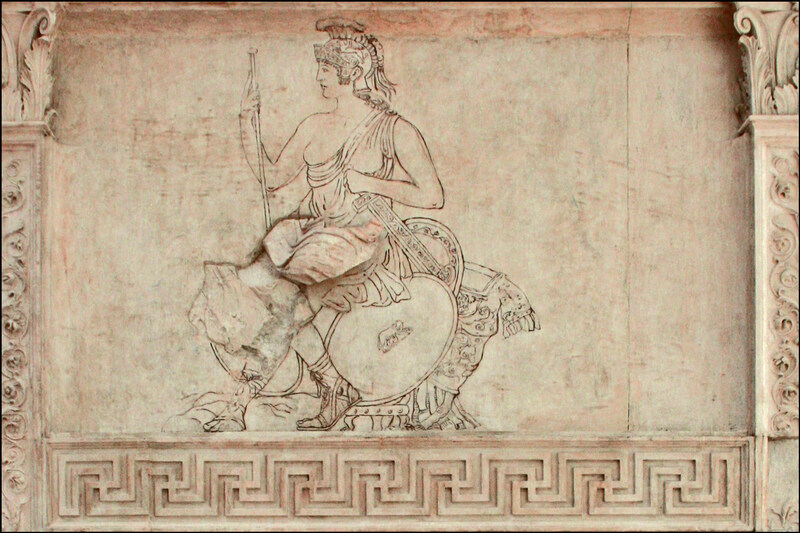 But in the second story, on the left and right sides of the forum, the columns are replaced by figures of women, by figures of maidensThese figures of maidens that replace the columns, that support the capitals, on top of their heads, and they flank this shield in the center with the depiction of a male head. This is the god Jupiter, a certain guise of the god Jupiter, Jupiter Ammon, as you can see him here, and we have information that tells us that Alexander the Great used to place shields in the Parthenon in Athens, and elsewhere, after great military victories, and it is possible that that sort of thing is being referred to here, because we know Augustus, like Pompey before him, had a thing for Alexander and liked to associate himself with Alexander. 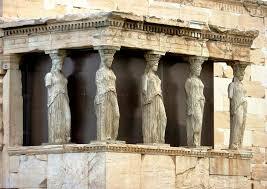 But most important for us is the fact that these maidens have clear precedents in the Greek world. The famous Porch of the Maidens on the Athenian Acropolis, fifth century B.C., the Erechtheion of Athens, fifth century B.C. Same set of maidens. We know that these had fallen into disrepair in the age of Augustus. Augustus visited Athens three times. 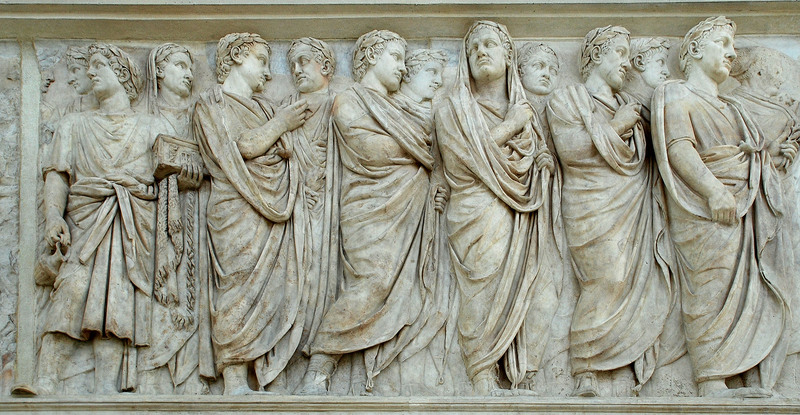 He did not like seeing these in disrepair, and in fact he had his own architects replace one of them with a Roman copy, and while they were doing that, they made plaster casts of these maidens, they brought those plaster casts back to Rome, and then in reduced scale they duplicated them for the Forum of Augustus in Rome. So appropriations from Greece; appropriations in part because Augustus liked them, but also I don’t think there’s any question that he was trying to draw a relationship between himself, his new Golden Age, and the Golden Age of Periclean Athens. We also have evidence for what the pediment, the sculpture in the pediment looked like, and I want to turn to that now. 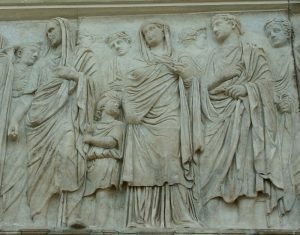 This is a relief that dates to a slightly later period that purports to represent the pediment of the Temple of Mars Ultor. And I show it to you here, and we can tell from this exactly what the sculptural display was all about in the pediment of this temple. We see here in the center, not surprisingly, Mars Ultor himself; Mars Ultor depicted with a bare chest. Next to him, to his right, to our left, we see a figure of a woman. This is Venus, and Venus, as you can see, has something on her left shoulder. It is a Cupid. So Venus with Cupid, Venus the consort of Mars. 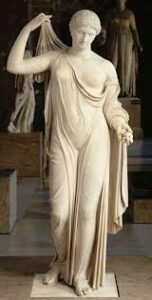 And then over here a personification that we believe depicts Fortuna: Fortuna, the goddess of Fortune, who brought fortune to Augustus in his battle. 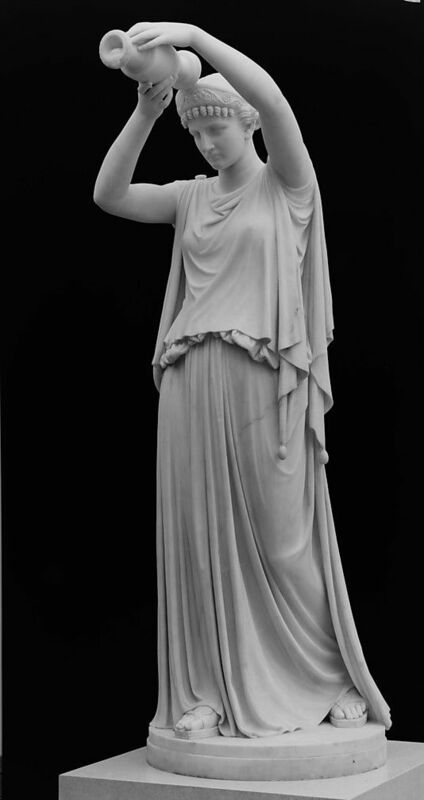 And then a seated figure of Roma, with her arms and armor. Keep this figure in your mind, because I’m going to show you another seated Roma very soon. And then a reclining figure of the Tiber River, the river on which Rome was built. Over here, a seated figure we believe is Romulus, the founder of Rome, on the Palatine Hill. And over here a reclining personification of the Palatine. So, most important, that the building honored, of course, Mars Ultor, and that Mars Ultor was depicted in the pediment. 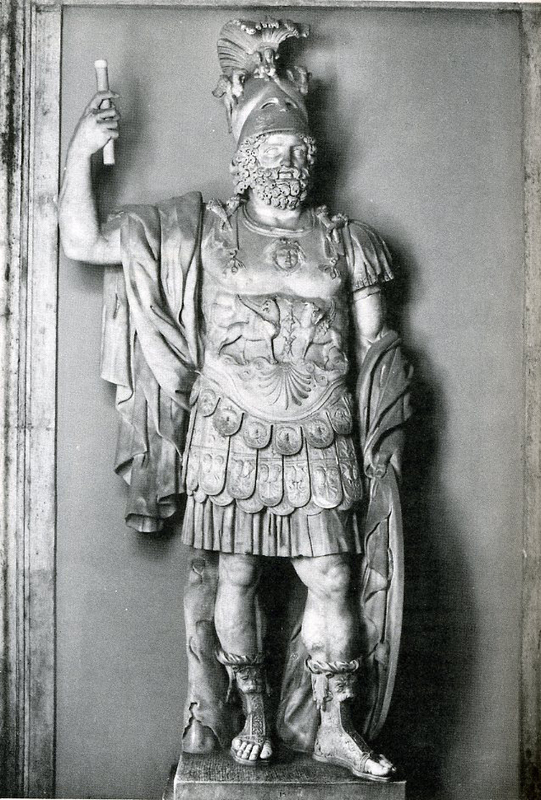 There was also a cult statue inside the Temple of Mars, and we believe we know what that looked like as well, because we believe we have a copy of it in a relief from Algiers that is still preserved, that depicts Mars, in the center, this Mars Ultor again, this time the warlike Mars Ultor, because you can see he’s wearing his breastplate and his helmet. His consort, Venus, is once again by his side. Venus is very seductive. Her drapery is falling off her shoulder. They were able to shed a fair number of years and were depicted in much younger versions in their divinized state. So this probably a reflection. 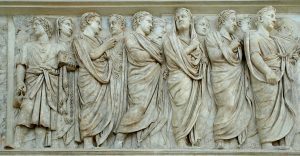 As you can see, the figures stand on bases, and figures that stand on bases in Roman relief sculpture are usually meant to be statues, and we believe that this is again a rendition of what those statues would have looked like inside the temple. 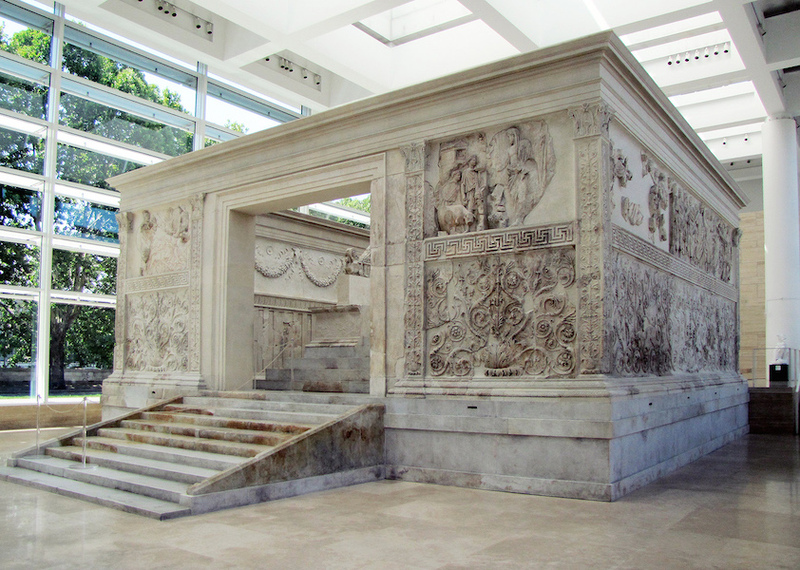 We believe that the monument being referred to here is the one that you see above, The Ara Pacis Augustae, made entirely of Luna or Carrara marble, solid Luna or Carrara marble, and even more of a marble building, in a sense, than the temple and forum that we’ve looked at thus far. It is a marble building that we believe that we know. We know its dates quite specifically. We know that it was consecrated on the 4th of July–an easy date to remember, for all of us–the 4th of July in 13 B.C. was when it was consecrated, and it was completed and dedicated on the 30th of January in 9 B.C. ; the 30th of January just happened to be the birthday of Augustus’ wife, Livia. No coincidence there. She was obviously lobbying for that. So on her birthday, 30th of January in 9 B.C., this structure is dedicated. The fact that there were double doorways — very significant, and we’ve tried to sort out why that might be. There are two possible precedents or two possible references that are being made here. One, to a Greek altar, a Greek fifth-century B.C. altar, which shouldn’t surprise us since we’ve seen that Augustus is looking back at the fifth century B.C. in Greece and mining it for architectural ideas and associations. 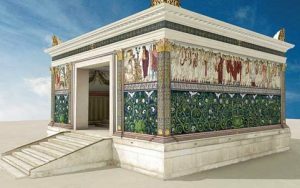 We see here what is a restored view of the Altar of the Twelve Gods, or the Altar of Pity, that was located in the Greek marketplace, in Athens, the Athenian Agora, the marketplace in Athens, fifth century B.C. 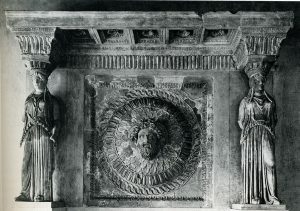 You can see that it consisted of an altar in the center, with a precinct wall, with double doorways, one on either side here, and with relief sculpture. So it looks like that might well be an important model, again not surprisingly since it dates to the fifth century. 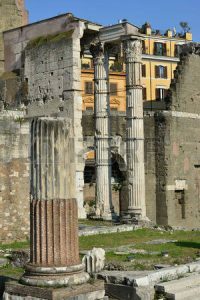 But also important, and I show you an image of it on a Roman coin here, is the so-called Shrine of Janus, the two-headed god, which we know is located in the Roman Forum. And tradition had it that when the doors–because it had double doors; well it had two sides because he was a two-headed god. 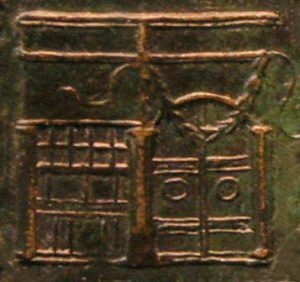 So two sides, both with doors, both with double doors, and that when those double doors were closed, it signaled that peace reigned throughout the Empire. And we know in the Res Gestae, Augustus tells us that he closed the doors of the Shrine of Janus, he brags, three times during his reign. So it is very likely that the double doors on the Shrine of Janus are referred to, not surprisingly, in an altar that was put up to peace, to the peace that Augustus brought to Rome through his various military victories and also through his diplomatic conquests, his diplomatic treaties like the one that he signed in Spain and Gaul. We also see if we look at–we’re now inside the monument, we’ve looked at the altar proper. 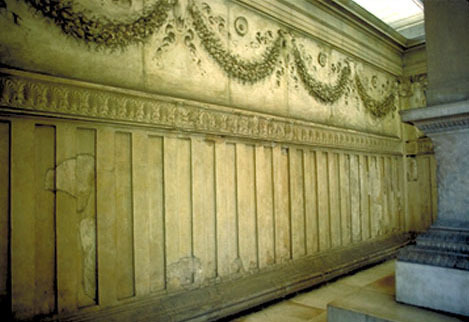 If we look at the precinct wall, the inside of the precinct wall, we see that is very well-preserved, and we see it is zoned, essentially two zones, with slats, all done in Carrara marble, slats down below that look like either a wooden wall or perhaps a fence of some sort. 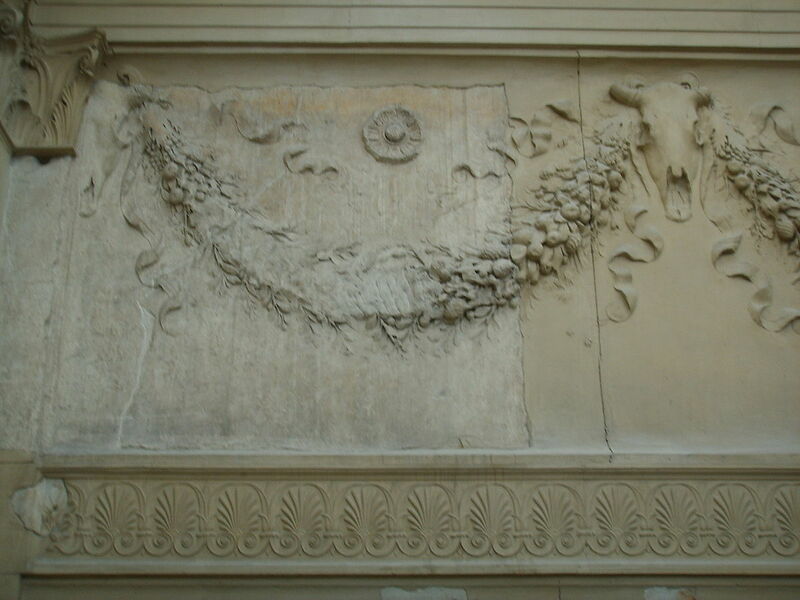 Then above, also depicted in Carrara marble, these great garlanded swags that you see hanging from pilasters, but also from the skulls of bulls that have been sacrificed on this altar. And then above the swags you can see these libation dishes. Remember they’re consecrating it already in 13 B.C., but the structure itself isn’t built until 9, and they have to keep offering this annual sacrifice. So they have to offer it somewhere. 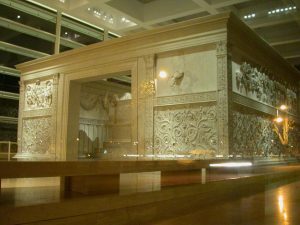 So the suggestion is they made a makeshift wooden altar, that looked like this, with actual wooden slats, wooden poles, real garlands and so on, and that what they’ve done on the altar is to create a rendition of that on the interior precinct wall of the Ara Pacis. The axonometric view shows you that the outside had a series of panels, square panels, four of them on the short sides and then–or on the front sides, where the doors are, flanking the doors — and then on the other sides, the north and south, a frieze. 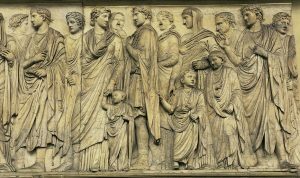 And I show you a detail of that frieze; a friezeSuffice it to say though that Augustus, senators, magistrates, members of the priesthood, members of the imperial family, all take part in these processions that are located on the north and south. Those processions rest on these acanthus plants down below, which when you think of it has absolutely nothing to do with reality, because how could a procession of human figures be supported by acanthus plants below? 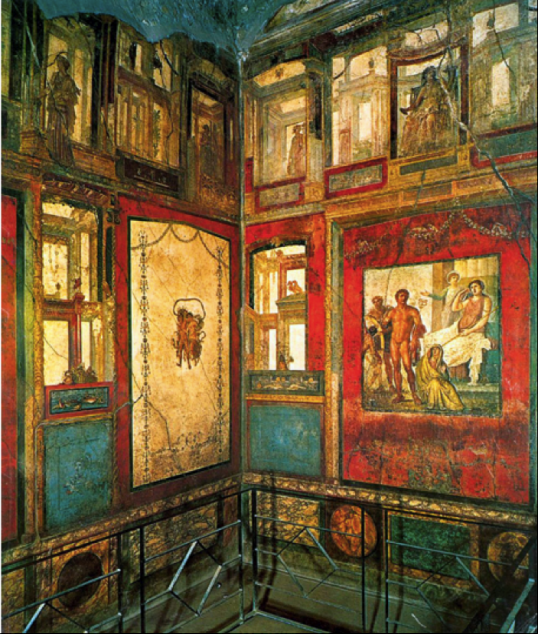 Impossible, and yet it is–some of that fantasy thinking that we saw in Third Style Roman painting, and I show you–I remind you of a detail of Garden Room Q over here, where we saw some of that fanciful Third Style painting, seems to come into play here. In fact, the delicate acanthus leaves, absolutely beautifully rendered in the Ara Pacis. You see the same sort of thing in the black background of the Garden Room Q. So again, interesting correspondences between painting and architectural decoration. 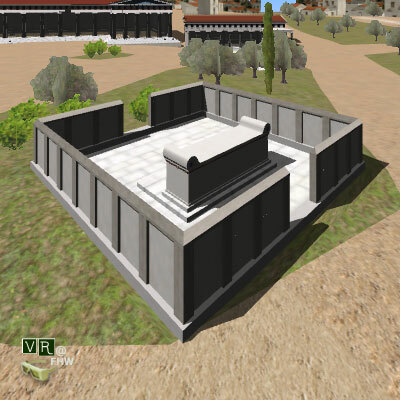 Perhaps most interesting to all of us from the point of view of architecture is the original location of this monument in relationship to Augustus’ tomb, and also what has been happening there in recent years, under the direction of the famous American architect Richard Meier. Above is an aerial view, showing the Mausoleum of Augustus, this large round tomb. We see the Meier building here. And I show you the travertine–because Meier was careful to use at least some travertine in this structure–the travertine base; although this was not his, this actually belongs to an original precinct that was located before, that was done by Mussolini’s architect, with the entire text of the Res Gestae. Meier kept that and kept that wall as part of his own building. This is the interesting inscription that makes reference to Mussolini at the tomb of Augustus. 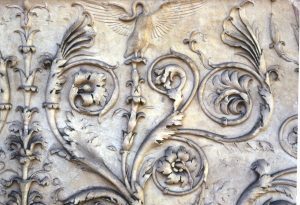 And note the flying victory figure, which we’ll see decorates often Roman arches, carrying this bundle of twigs and rods that the Romans, the Roman bodyguards of the emperor used to carry, these so-called fasces. If you ever wondered where the word Fascism comes from, it comes from the Roman fasces. Mussolini’s name, you can see part of it here, M-U-S-S-O-L; part of it scratched out after his death and discredit in the ’30s. And then ultimately, what’s been interesting to me is I’ve watched this inscription and photographed it year after year, whenever I’m there. I’ve noticed that Mussolini is having something of a revival in Italy, and there’s a good deal of interest in him. 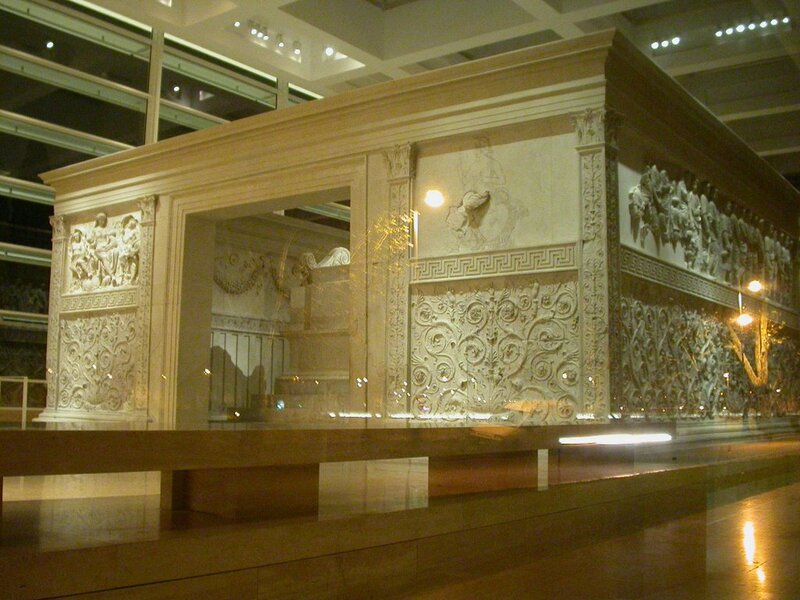 I just wanted to make a point about the siting of the Ara Pacis and its relationship to the Mausoleum of Augustus. 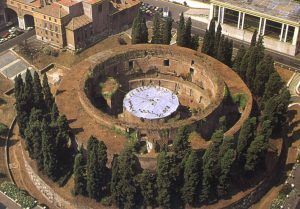 Remember, it’s no longer in its original location it’s right next to the Mausoleum on the Tiber. That was not its original location. It was located along the ancient Via Flaminia, the street that Augustus took when he returned from Spain and Gaul. 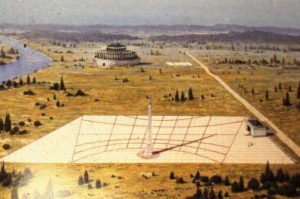 It had in front of it an obelisk that was brought from Egypt, and that obelisk was part of a sundial that was orchestrated carefully enough so that the shadow from the sundial would fall exactly on the center of the Ara Pacis, on Augustus’ birthday. That’s how carefully orchestrated it was, and the fact that there is an Egyptian obelisk, and there’s mention in the inscription on that obelisk of the victory over Cleopatra and Antony, at the Battle of Actium, and that the Ara Pacis commemorates his diplomatic treaties in the western part of the Empire, in France and Spain, seems to me to be a reference to the fact that Augustus was victorious in all parts of the Roman Empire: the western as well as the eastern part of the Empire. We’ve already talked about the fact that in the minds of the Romans, victory in battle and victory over death were essentially synonymous; both of them referred to here. I’m not implying that this was planned as a complex. The Mausoleum dates to 28 to 23. It was built much earlier than the Altar of 13 to 9. But I think when they decided to add the Ara Pacis to this complex, there was a great deal of thought that was given to siting it in relationship to the tomb, and to thinking about the whole as a complex, at least at that particular juncture. 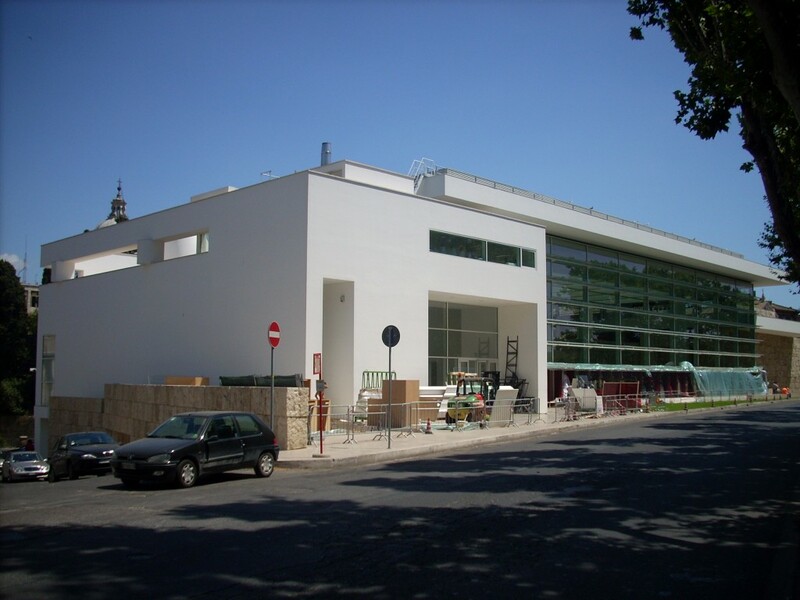 You can see the obelisk and the way in which it cast–it served as a sundial–cast a shadow toward the Ara Pacis. The area was not planned as a complex but grew into one. 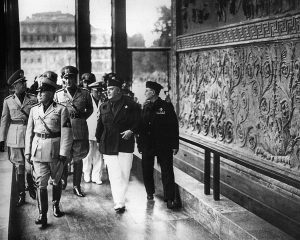 An image of Mussolini visiting the Ara Pacis after it was restored and dedicated and placed in a complex designed by his architect is shown above. And then an image down here of Richard Meier, celebrating the cleaning and placement of the Ara Pacis inside the new museum designed by him. And you can see, from this particular view, why some people think of it as a kind of white elephant that really doesn’t fit the tenor of the city. 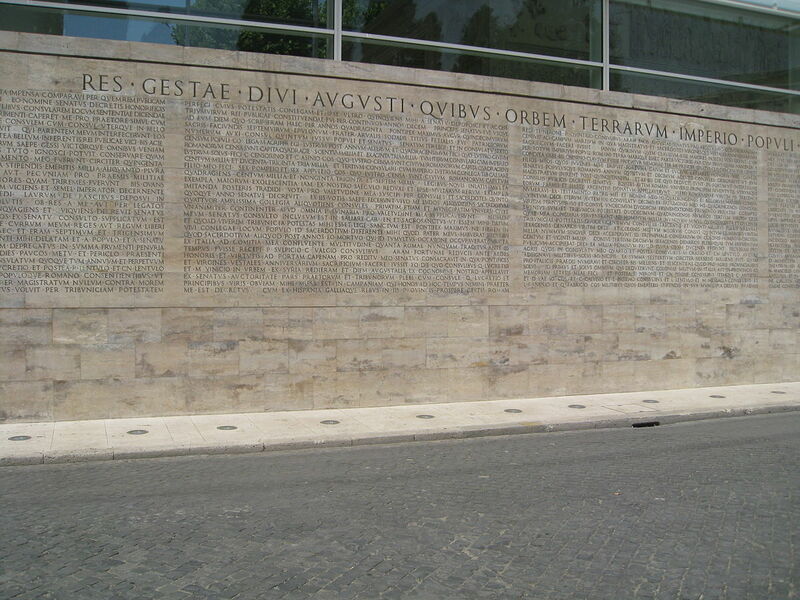 And, in fact, when it first opened in 2006, that graffiti had been added to, and they call it the Meier “criminale.” And over here, this is my favorite, it says: “meglio gli architetti di secoli fa,” meaning those architects of the past were a lot better than Meier, is the message here. So there are many people who do not like this building, and I think a case can be made with regard to the outside. There is a nod to ancient Rome with the travertine wall that is outside and continues inside. But it’s typical Meier white glass, and a lot of people feel that it doesn’t really suit the environment with the two Baroque churches right across the way, and so on and so forth. So I think a case can be made for the exterior. 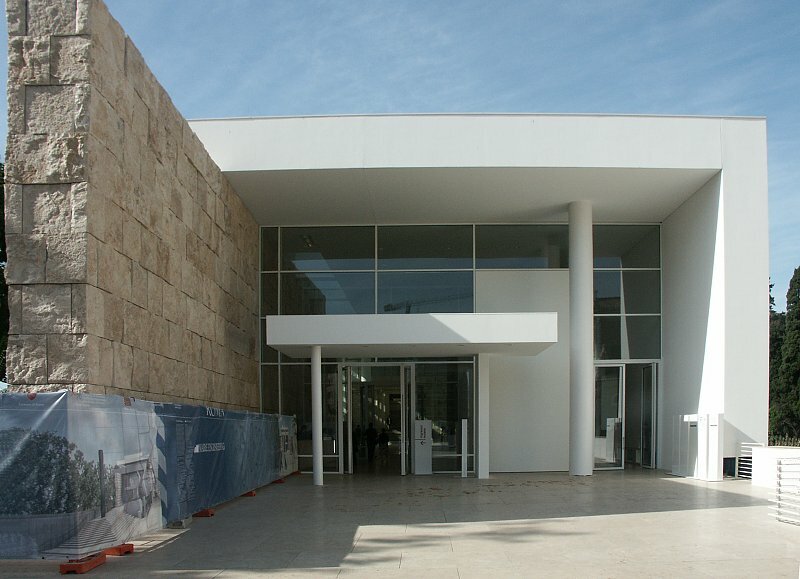 But when you enter into the museum, you pay your fee and then go into the door, and into the Ara Pacis itself. When you confront the building itself, in its new interior, I have to say I’m very impressed and very moved by this interior. You’ve got the sort of egg crate ceiling and these wonderful louvered windows that allow you to see not only Mussolini’s Fascist buildings next door, but also the Mausoleum of Augustus, that it really does give you a chance to see this altar in a way that it hasn’t been seen before. And especially at night, I enjoy seeing it at night, because as you go by it they have it lighted up. 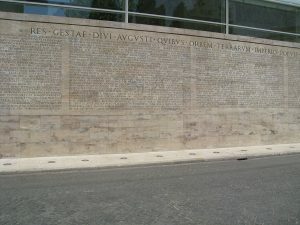 Driving along Lungotevere, the street along the Tiber River, and seeing the altar, the Ara Pacis Augustae lighted up inside the new Meier Museum, like a jewel in a jewel box, I can’t help but think Augustus is smiling somewhere to think that everything he did to try to preserve his memory for posterity has been done, and has been helped to a great extent by the great American architect, Richard Meier.